Writing c.518, a certain Theodosius, about whom nothing more is known, describes the famous shrine of St. George at Diospolis. The text is dated by its references to the Emperor Anastasius (491-518). From Emmaus to Diospolis it is twelve miles, where St. George was martyred: there too is his body, and at it many miracles take place. This is the lintel inscription from an octagonal shrine to St. George built in 515 at Zorava in the late Roman province of Arabia. As it reveals, the shrine was built over a pagan temple. The abode of demons has become the house of God. The light of salvation shines where darkness caused concealment. Where sacrifices to idols occurred, now there are choirs of angels. Where God was provoked, now He is propitiated. A certain Christ-loving man, the town-councillor John, son of Diomedes, offered a gift to God from his own property, a beautiful building, after installing within it the worthy body of the martyr George, who appeared to this John not in a dream, but manifestly. Writing in the 590s, bishop Gregory of Tours (573-94) reports the power of the relics of St. George in Gaul. I know many miracle stories about the martyr George, of which I will narrate a few. Some people were carrying his relics along with the relics of other saints. When these couriers came to a place in the territory of Limoges where a few clerics had already constructed an oratory from wood planks and were constantly praying to the Lord, they requested lodging. They were received with kindness and they spent the night chanting psalms with the other brothers. At daybreak they took the reliquary but could not lift it at all. Since they completely refused to travel without the holy relics, a great grief came into their hearts. They understood, by the inspiration of God, that they ought to leave some of the relics in this place. They searched in the fastenings [around the relics] and cut off some pieces; they presented them to the elder [cleric] who presided at the oratory. By leaving a part of their protection they received the opportunity of departing to where they wished to go. There are relics of George in the village [of Saint-Martin-des-Bois in the territory] of Le Mans, where often many miracles are revealed. For the blind, the lame, those with chills, and other ill people are often there rewarded with the favor of health. Writing about 555, the priest Cyril of Scythopolis, a monk of the Great Lavra in Palestine, reports that John Hesychast had rejected his life as bishop of Colonia in Armenia and used the occasion of a mission to Constantinople to flee to Palestine. He stayed briefly at a guesthouse founded by the Empress Eudocia (c.457-60 ) before entering the Great Lavra in 491. Note that Cyril's words do not require that Eudocia had constructed the chapel of St. George during her construction of the hospice itself c.457, nor even that this chapel had existed when John stayed there c.491, only that there was a chapel there at the time at which he was writing c.555. The hospice, and chapel, were on the road to Jaffa, about two miles west of Jerusalem. After arriving there and securing the interests of his church with the assistance of Archbishop Euphemius of Constantinople, towards the end of the reign of Zeno, he conceived the plan pleasing to God of withdrawing to the holy city and living by himself in isolation from the affairs of this life. Sending the priests and clerics with him on their way with the imperial decrees he had obtained, he gave them all the slip, embarking in a ship on his own, and came to Jerusalem, where he lodged just outside the holy city in the hospice founded by blessed Eudocia, the hospice in which there is a chapel of the holy martyr George. This text is so-called because its anonymous author is assumed to have been a Nestorian christian from Khuzistan writing c.660. Here he describes an event which occurred immediately following the Persian conquest of Jerusalem in 614. When the Persian commander also heard that many riches were to be found in the church of St. George at Lydda, he sent a large number of his soldiers, but they were unable to enter, however, being held back by divine power. But at last he (himself) went (forth) with great anger, and when he reached the door of the church, he urged on his horse to enter by force; but the hooves of the horse stuck to the ground and he could neither move on forwards nor go backwards. (Thus) God showed that although he had allowed him to enter Jerusalem, (he had not done so because) his power was weak, but in order to punish the Romans, who said that Khusro could not hold power over Jerusalem. He (the Persian commander) vowed, 'If I escape, I shall make an object of silver in the likeness of the church of St. George'. And so it turned out, and, behold, this miraculous object has hung in the church until now. Writing c.683/6, abbot Adamnan of Iona reports two tales which he claims to have heard from the lost pilgrim bishop Arculf concerning the shrine of St. George in Diospolis. The holy man Arculf, who told us all these things about the cross of the Lord, which he saw with his own eyes, and kissed, brought us [p. 113] another story concerning a confessor, George by name. This he learned in the city of Constantinople from some well-informed citizens, who used tell it to him in the following terms: In the city of Diospolis, in a certain house, the likeness of the confessor George is depicted set on a marble column. He was bound to the column and flogged during the time of persecution. After the flogging, however, he was released from his bonds and lived for many years. Now one day a hardhearted wretch, an unbeliever, entered that house mounted on horseback, and on seeing the marble column he questioned the inmates saying: 'Whose image is this depicted on the marble column?' They answered saying: 'It is the picture of the confessor George who was bound to this column and flogged.' On hearing this the stupid fellow became very angry with the insensible object, and at the instigation of the devil struck at the likeness of the holy confessor with his lance.And the lance of this adversary easily penetrated the column, passing through the outer surface in a wondrous fashion as if it were a soft mass of snow. Its point stuck fast in the interior and could not possibly be withdrawn, while the haft which had struck against the marble likeness of the holy confessor was broken off on the outside. Simultaneously the miserable fellow's horse too, on which he was mounted, fell dead under him on the pavement of the house; and as he was falling himself he placed his hands against the marble column , and his fingers sank into it as if it were fine dust or mud and remained fast. When the unfortunate fellow perceived this, that he was unable to withdraw the ten fingers of his two hands, which remained stuck fast in the marble likeness of the holy confessor, he did penance and invoked the name of the eternal God and of the confessor, begging with tears to be freed from the bond. The merciful God, who does not wish the death of the sinner but that he be converted and live, accepting this tearful repentance, released him not just from the visible marble bond of the moment, but absolved him also from the invisible fetters of sin, mercifully succouring him now saved by faith. This clearly shows the character and magnitude of the honour George, His confessor amid tortures, has before the Lord. The figure, in a material naturally impenetrable, he rendered penetrable by his power, and likewise the lance of the adversary, impenetrable by nature, he wondrously made penetrable, and the fellow's weak fingers he powerfully made to penetrate into that substance by nature impenetrable. At first when the fingers remained fast in the marble the hardened man was unable to withdraw them; but he became instantly very frightened, and then softened and penitent, and by the mercy of God he withdrew them. Wonderful to relate, to this day there remain in the marble column the prints of his ten fingers inserted up to the roots, and into their place the holy Arculf inserted his own ten fingers, they likewise penetrating up to the roots. The blood of the wretch's horse too, whose thigh was broken in two as he fell dead on the pavement, could not be cleansed or wiped away by any means, but there it remains indelibly on the pavement of the house up to our times. The holy Arculf gave us another true story also about this confessor George, which he learned accurately in the above-mentioned city of Constantinople from some well-informed and quite reliable narrators. This was the tale they used to tell about the holy confessor: At a time when many thousands from every quarter were coming together to form an expedition, a certain fellow, a layman, mounted on horseback, entered the city of Diospolis. He approached the house where the above-mentioned marble column is, which has depicted on it the likeness of the holy confessor George, and entering it began to address the image as if George were present, saying: 'I commend myself and my horse to thee, George the confessor, that by virtue of your prayers we may both return safe from this expedition and reach this city, delivered from all dangers of wars and pestilences and waters. And if, according to the prayer of our littleness, the merciful God grant to thee our successful return, I will bestow on thee as a gift this steed of mine, which I love exceedingly, assigning him in the prsence of thy image.' Speedily terminating these remarks, this fellow left the house, mingled with his other companions in the multitude of the army, and went off with the expedition. Then after many and divers dangers of war, in which thousands of unfortunate people perished, he got back safely to Diospolis mounted on that same beloved horse of his, having by God's grace escaped all evil chances, since he commended himself, as mentioned above, to George the servant of Christ. He joyously entered the house where the image of the holy confessor was, bearing with him gold as the price of his horse, and he addressed the holy George as if he were present, saying: 'Holy confessor, I give thanks to the eternal God, who by the steadfast prayer of your loftiness brought me back safe; and because of that I give thee these twenty gold sovereigns as the price of my horse, which thou hast conserved for me to this day since he was first commended to thee.' While saying this he laid the said sum of gold before the feet of the holy confessor's image, loving his horse more than the gold. His devotions completed, he went out, mounted the beast in question, and spurred him onward. But nothing would induce him to move. Realizing this the fellow dismounted, went into the house again, and offered ten sovereigns more, saying: 'Holy confessor, thou wast indeed a gentle protector to me as I rode amid the perils of the expedition; but nevertheless, I see, in horse dealing thou art hard and greedy.' With this remark he added 10 sovereigns to the 20, and said to the holy confessor: 'I am giving thee these sovereigns too that thou mayst be appeased and set my horse free to walk.' Then he went out again, mounted the horse, and urged him forward; but he kept standing as if fixed in that place, and could not move even one foot. To cut the story short: after mounting and dismounting fully four times, going into the house with 10 sovereigns, coming back to the immovable horse, and again back to the house, he kept running from one point to the other, and all the time nothing could succeed in moving his steed, until finally the collected sum of sovereigns amounted to 60. Then he would repeat too the above-mentioned remarks about the gentle kindness of the holy confessor and his safe guardianship during the expedition, mentioning also his hardness, as it were, or even greed, in dealing. According to the story he would repeat such language on his return to the house on each single occasion of the four. On the final occasion he addressed the holy George as follows: 'Holy confessor, now I know thy will for certain, and accordingly I offer thee as a gift the whole sum of gold thou askest, that is 60 sovereigns, and my steed too which I originally promised to donate to thee after the expedition, I now donate bound as he is by invisible bonds, but soon, I believe, to be released through thy honour before God.' After these remarks he went out of the house, and at that moment found his steed released. He led him into the house and assigned him as a gift to the holy confessor in the presence of his image and he went away from there joyfully, magnifying Christ. The clear conclusion from this is that whatsoever is consecrated to the Lord, whether it be man or animal, according to what is written in the book of Leviticus, can by no means be redeemed or changed. For if anyone change it, both that which is changed and that for which it is changed shall be consecrated to the Lord and shall not be redeemed. Pope Zacharias (741-52) claimed to have discovered the head of St. George in the Lateran basilica at Rome and translated it to the deaconry of St. George. In his time our Lord God saw fit in this city of Rome to disclose a great treasure through this bountiful pontiff. 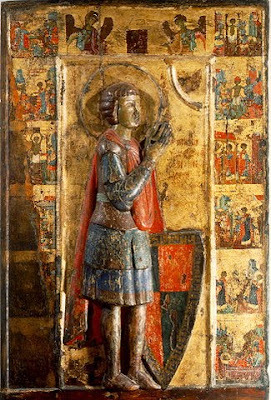 In the venerable patriarchate the holy pope discovered St. George the martyr's sacred head, kept safe in a casket; in this he also found a note made out in Greek letters, indicating its identity. The holy pope, altogether satisfied, immediately convened the city of Rome's people, and caused it to be taken with hymns and spiritual chants to the venerable deaconry which is dedicated to him in the city, in the 2nd region at the Velabrum; and there almighty God sees fit to work infinite miracles and benefits to the praise of his own name through this sacred martyr. Writing during the late 8th-century apparently, Epiphanius the monk, otherwise unknown, describes the same miracle-working column at Diospolis as already mentioned by abbot Adamnan of Iona. And again from that place eight miles away is Ramla, and near Ramla the place Diospolis. The .... is Saint George. There rest the remains of the Great Martyr Saint George. The church is very large, and in its chancel lies the torturer's wheel. And on the right side of the nave stands a column to which the wheel is tied. On the day of his memory blood flows for three hours. In the same column there is a crack in the marble which gives signs; if you tell the truth you can go through without hindrance, and without difficulty, but if you do not tell the truth you cannot go through. Writing about 1063, the courtier Michael Psellus describes how the Byzantine emperor Constantine IX (1042-55) had rebuilt the Church of St. George of Mangana in Constantinople. In this catalogue of the emperor's foolish excesses, I now come to the worst example of all - the building of the Church of St. George the Martyr. Constantine pulled down and completely destroyed the original church; the present one was erected on the site of its ruins. The first architect did not plan very well, and there is no need for me to write of the old building here, but it appears that it would have been of no great dimensions, if the preliminary plans had been carried out, for the foundations were moderate in extent and the rest of the building proportionate, while the height was by no means outstanding. However, as time went by, Constantine was fired by an ambition to rival all the other buildings that had ever been erected and to surpass them altogether. So the area of the church and its precincts was much enlarged, and the old foundations were raised and strengthened, or else sunk deeper. On these latter, bigger and more ornate pillars were set up. Everything was done on a more artistic scale, with gold-leaf on the roof and precious green stones let into the floor or encrusted in the walls. And these stones, set one above the other, in patterns of the same hue or in designs of alternate colours, looked like flowers. And as for the gold, it flowed from the public treasury like a stream bubbling up from inexhaustible springs. The church was not yet finished, however, and once again the whole plan was altered and new ideas incorporated in its construction. The symmetrical arrangement of the stones was broken up, the walls pulled down, and everything levelled with the ground. And the reason for it ? Constantine's efforts to rival other churches had not met with the complete success he hoped for: one church, above all, remained unsurpassed. So the foundations of another wall were laid and an exact circle described with the third church in its centre (I must admit that it certainly was more artistic). The whole conception was on a lofty and magnificent scale. The edifice itself was decorated with golden stars throughout, like the vault of heaven, but whereas the real heaven is adorned with its golden stars only at intervals, the surface of this one was entirely covered with gold, issuing forth from its centre as if in a never-ending stream. On all sides there were buildings, some completely, others half-surrounded by cloisters. The ground everywhere was levelled, like a race-course, stretching farther than the eye could see, its bounds out of sight. Then came a second circle of buildings, bigger than the first, and lawns full of flowers, some on the circumference, others down the centre. There were fountains which filled basins of water; gardens, some hanging, others sloping down to the level ground; a bath that was beautiful beyond description. To criticize the enormous size of the church was impossible, so dazzling was its loveliness. Beauty pervaded every part of the vast creation, so that one could only wish it were even greater and its gracefulness spread over an area still wider. And as for the lawns that were bounded by the outer wall, they were so numerous that it was difficult to see them in one sweeping glance: even the mind could scarcely grasp their extent. It was not merely the exceptional beauty of the whole, composed as it was of most beautiful parts, but just as much the individual details that attracted the spectator's attention, and, although he could enjoy to his heart's content all its charms, it was impossible to find one that palled. Every part of it took the eye, and, what is more wonderful, even when you gazed on the loveliest part of all, some small detail would delight you as a fresh discovery. To attempt to place its various merits in any order of preference was useless for, when all the parts were so lovely, even the least attractive could not fail to give pleasure inimitable. Its every detail excited the greatest admiration. People marvelled at the size of the church, its beautiful symmetry, the harmony of its parts, the variety and rhythm of its loveliness, the streams of water, the encircling wall, the lawns covered with flowers, the dewy grass, always sprinkled with moisture, the shade under the trees, the gracefulness of the bath. It was as if a pilgrimage had ended, and here was the vision perfect and unparallelled.